Guitar Blog: So what's happened to guitar since 2001 and why is it on the way back? So what's happened to guitar since 2001 and why is it on the way back? The guitar enjoyed a boom for a long time but in recent years guitar as we know has slipped a little but due to new circumstances is set to rise again. The guitar enjoyed uninterrupted growth in popularity until 2001 because there was no real competition. Its one big advantage was convenience but then something happened. Technology caught up. Desktops, laptops, iPads, iPhones etc are now offering convenient musical options. In a sense it was the piano/keyboard's revenge. The new technology made it possible to play keyboard, write songs and do full band arrangements without even owning a musical instrument. Computer technology is in actual fact the most versatile musical instrument available today and has recently become the most convenient one. It stays in tune, it remembers your songs, it has unlimited range of sounds and possibilities and its easy to learn and it always sounds great. It has surpassed the guitar for convenience, sound quality and it seems price. I will point out that I am in no way suggesting a computer can replace the feel of a real guitarist playing a real guitar but you need to spend a lot more to get the sound quality. Digital music programs have also became affordable and even free in some case and are of a high enough quality that anyone with a basic music knowledge can produce quality recordings. With computer technology making music with a keyboard is easy whereas plugging in, setting up and tuning your guitar takes more effort. It would be easy to assume that people play guitar because its popular. While this is indeed true the guitar basically became popular because it was convenient. Some popularity was lost because technology became more convenient but the reason guitar is set to rise again is because guitar technology has now arrived. Guitar is back. Guitar took a dip but the quality of software like Guitar Rig 5 is making it possible to skip the amp and mic process altogether. Go back to the 60's and solid body electric guitars were heavy. 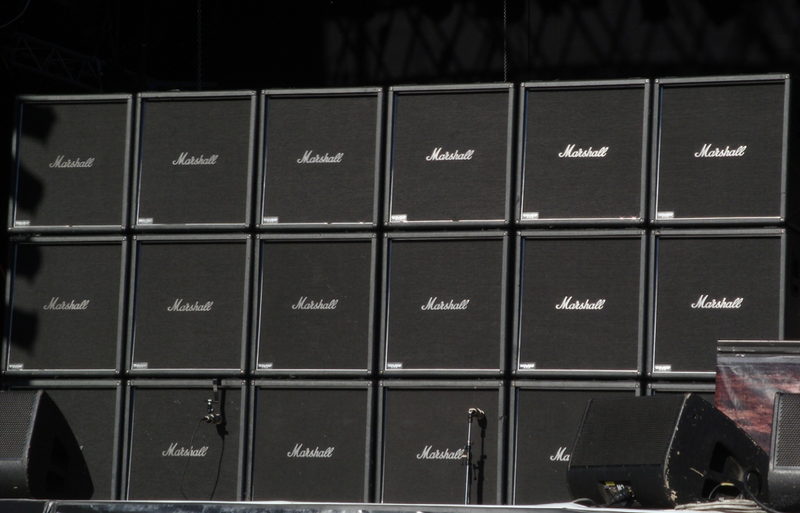 Add your Marshall stacks effects racks and you were suddenly carting around about the equivalent of an upright piano. Guitarists with back, neck and shoulder injuries were becoming common place. The guitar itself was still convenient but rock guitar especially required some heavy lifting. Computer technology for keyboards (MIDI) has been developing for decades but guitar was mostly left out of the picture. In the 60's and 70's when MIDI was developing guitar players really had no interest in plugging their guitars into anything other than an amp. This is in turn meant developers tended to leave guitar players alone. By 2001 guitar players began disappearing from the pop charts. Guitarists like everyone else were starting to realise that computer technology had stepped up its game. Over the past decade we have seen dramatic improvements in guitar amp modeling technology and now many of the skeptics are beginning to change their mind. I think 2011 is the turning point because guitarists are back in the game. They can now plug in and get studio quality sounds (something keyboard players have had for many years now). This makes it very convenient. Recording decent guitar tracks does not required a million dollar studio with state of art equipment. This means guitar players will be recording more music and in turn more people will want to play guitar. 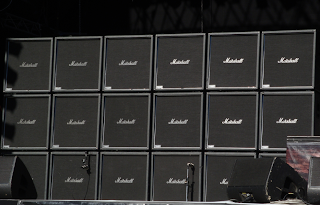 I think guitar players using amp stacks will always be around but their glory days are probably behind them. Marshall by the way on Ngram has been dropping in popularity since 1980.